Learning from their industry first Hold-Tite Foot for Scooters, Bruno has designed a Hold-Tite Arm for Power Wheelchairs with flip-up armrests. Learning from their industry first Hold-Tite Foot for Scooters, Bruno has designed a Hold-Tite Arm for Power Wheelchairs with flip-up armrests. 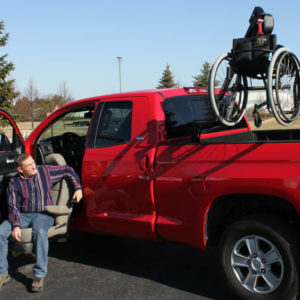 Simply roll the wheelchair on to the platform, flip-up the inboard armrest and push the button. The platform will rise and securely “squeeze” your chair to the Hold-Tite Arm. As with all Bruno lifts, the ASL-250HTP has undergone extensive testing to make sure your investment is safe, even on rougher roads.